It is the policy of St. Petersburg Opera Co. to comply with all of the requirements of the American Disabilities Act. To request materials in accessible format, sign language interpreters, and/or any accommodation to participate in SPO programs and performances, please contact Susan Hellman Spatafora at (727) 823-2040 at least two weeks prior to the performance of your choice. Assistive listening devices are available at the Palladium Theater. To request one, please contact the Palladium box office in advance at (727) 822-3590. Our Opera Central Facility is ADA compliant with ramp access in the front and rear of the building (enter through the front). We do our best to make certain other venues at which we perform are accessible to all. If you cannot get a hold of a performance venue in advance to make accommodations or find accessibility information, please contact us so that we may ensure your safety and comfort. 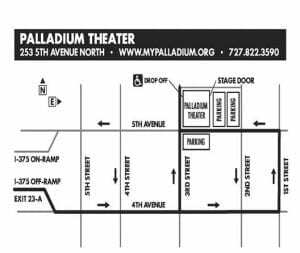 To access the elevator at the Palladium Theater performances, enter on 3rd Street near the rear of the building. Click here to find out more about Palladium Theater parking options. Because the Palladium Theater has limited parking, please plan to arrive early to performances. Should you park in the garage at 350 Third Street North for an SPO production at the Palladium, we provide transportation service with a Maher Chevrolet courtesy vehicle and volunteer driver to and from the theater for your convenience. Shuttle service begins about an hour before the performance (as soon as Palladium lots are full) and resumes at the conclusion of the show. Thank you for your support and patronage of St. Petersburg Opera Co. See you at the show!